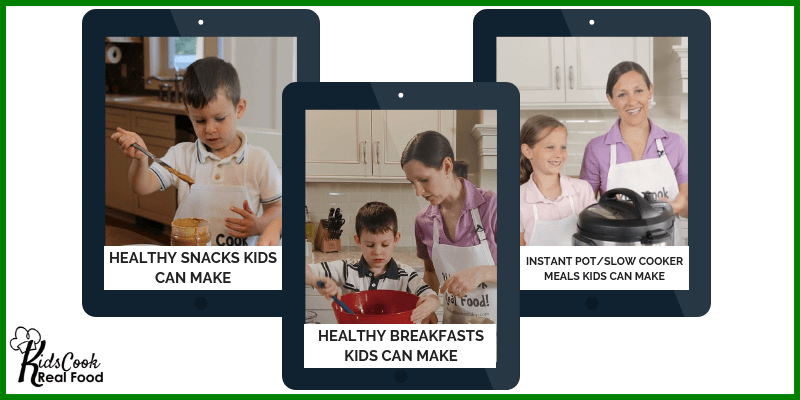 Concierge Experience – Kids Cook Real Food eCourse What is the Concierge Experience? Make the Classes Even Easier to Teach! Don’t be afraid to get started — Upgrade your membership for 1-on-1 time with the teacher, a kid-friendly supply box in the mail, and more! You want your kids to have life skills and Independence and grow to be healthy, confident adults. You’re excited but nervous to teach them to cook… And you may worry about your own human weaknesses. Maybe you are not a finisher, and you are afraid that you will do a class or two with gusto, and then motivation will wane. Maybe you know a little excuse like not having the right ingredients will be enough to cause you to skip a class, and that you might not get back to them. 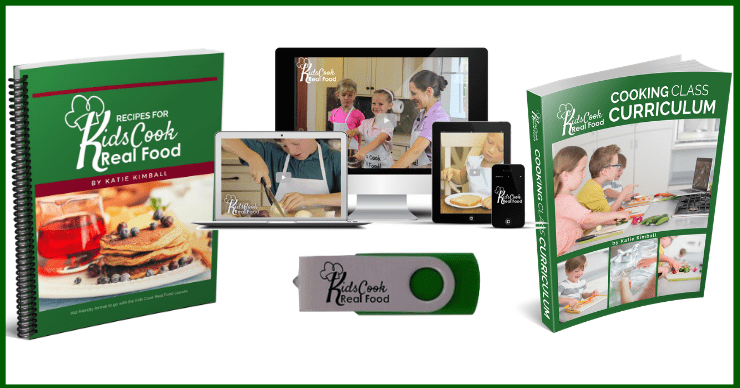 where I will join you in your kitchen virtually and make this online course more like an in-person class. Get everything you need to inspire and motivate you in your quest to build healthy, independent children! Click PLAY for a little welcome message from me (& to see all the goodies)! Online Demo and Q&A: Once a month, you have an actual date with me for a LIVE teaching session (15 mins) and 45 minutes to ask questions about whatever might be getting in your way, figure out how best to get your kids (with their very individual tendencies) to widen their palate or get motivated in the kitchen. Bring the kids if you can for a live demonstration of one of our 30-plus kitchen skills with new troubleshooting tips! These calls will be recorded with cheat sheet notes, so you can also benefit from past sessions in case you are not the only one having a certain experience. It’s rare that we are alone in a struggle! 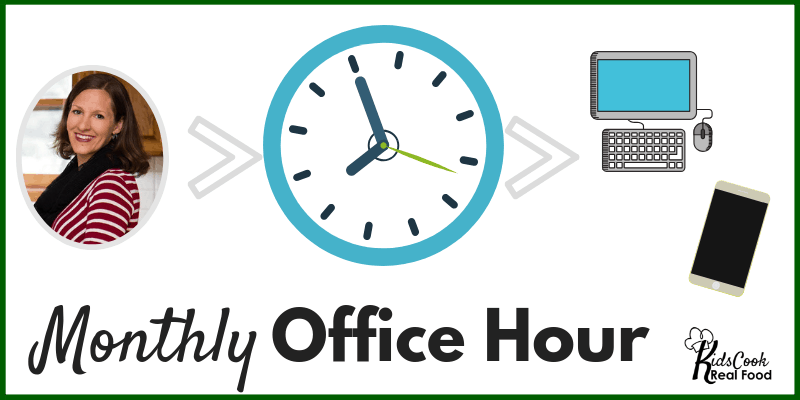 We guarantee office hours will be available as long as the Concierge Experience is offered plus a minimum of 6 more after that. Each family will have a chance to set up a 15-minute call just with me, the teacher, for whatever reason you choose. I can watch your kids do some skills and give pointers, just as I would in person, or we can find solutions to your challenges, and either way you will leave the call more inspired and motivated to get your kids in the kitchen than ever, brimming over with confidence and courage to make it happen. We love technology too, but sometimes you just want the real thing in your hand. Flip through the lesson plans and quick start guides while your kids are watching the video, and take the spiral bound recipe book into the kitchen to get its proper greasy fingerprints and penciled notations. 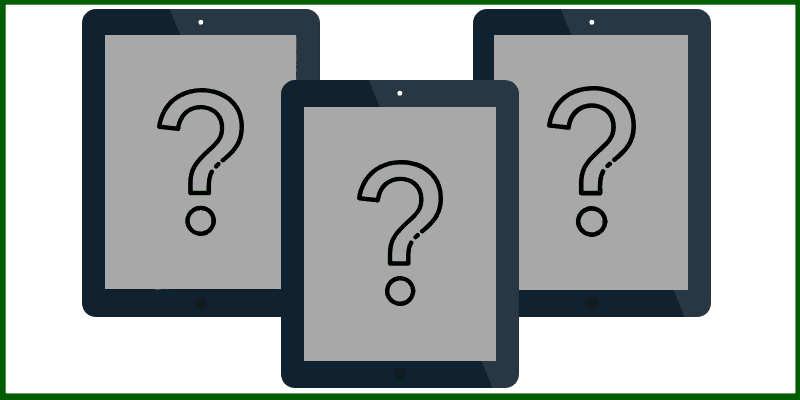 PLUS you get guaranteed free access to any future Thematic SkillLabs we create! Considering I am always full of ideas, this could be priceless. 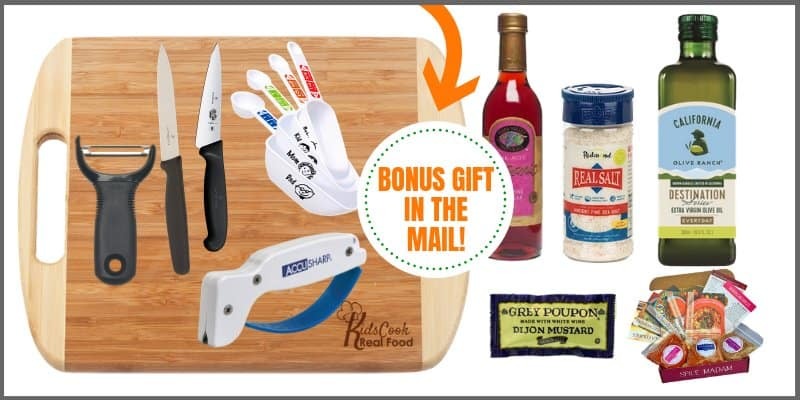 You won’t be afloat without a paddle with this special Kids Cook Real Food set. It’s everything non-perishable you need to teach class 1 at all three levels, so no supply list management to stress you out or cause a bump in the road of your progress. Actual contents of box may vary but value guaranteed. Our favorite kid-friendly kitchen tools and even food you don’t have to add to your grocery list, delivered to your home absolutely FREE! Set your goals for your kids, knowing that teaching them to cook will have powerful benefits beyond expectations. Sit back, turn on the video, and watch their connection, confidence, and creativity blossom. I will serve you the answers and inspiration you need, and soon enough, your kids will be serving you breakfast in bed! Save over $1000 on this done-for-you opportunity! Yes, I want the Concierge Experience! Everyone loves getting something in the mail. Having something REAL on the calendar will encourage you to really use your membership. Talking to the teacher one-on-one will focus and inspire you like no other conversation – I pledge to bring 110% of my energy to every coaching call conversation and I can’t wait to meet you! Extra repetition during office hours will make each skill stick so much better for your kids. Building connection, confidence and creativity for your kids along with life skills and independence in the kitchen is a beautiful gift for your children. Making it easier for you to get it done and feel great about the experience is a beautiful gift for yourself! Only interested in a package in the mail? Check out the 2 different sizes available right here! 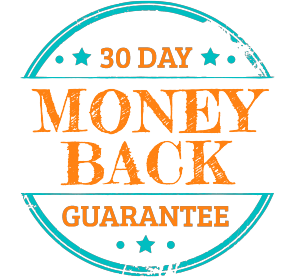 but we offer full digital refunds for any reason anytime within the first 30 days of access, which applies to the VIP Level, Thematic SkillLabs, Office Hours and Coaching Calls. Physical products shipped to your home are non-refundable since it includes food, which cannot be reused once it’s in your home.